These lightswitch plates made such successful Christmas presents for family and friends, I have made more editions of plates for sale. There are three versions: a tread plate, a cat plate, and a plate inspired by the diamond plate pattern. All are cast bronze with various patina finishes: green, brown, and black. The bronze cat switch plate is sold out. 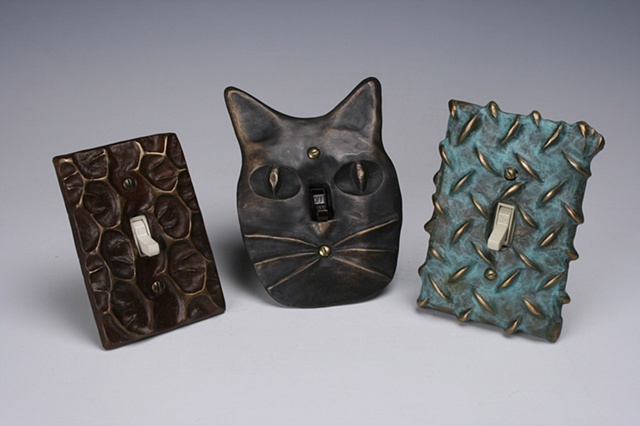 I now cast switch plates, including the cat plate and other varieties, in polymer plastic with bronze powder. Please refer to my PLASTIC CASTING page on this website or visit my Etsy store "Debsaw", where they are available for purchase at $15 each.